BQB_Site's View: Antwaan Randle El (born August 17, 1979 in Riverdale, Illinois) is a wide receiver and punt returner for the Washington Redskins of the National Football League. A converted dual threat QB at Indiana, his quarterback experience allowed the Steelers to use him as a passer in a variety of trick plays, most notably a game-clinching 43-yard fake reverse touchdown pass to Hines Ward in Super Bowl XL. He was the third non-quarterback and the first receiver to throw a touchdown pass in the Super Bowl. At Indiana, he was considered one of the premier offensive threats in the Big Ten Conference and received Heisman consideration, though he played on some bad teams (coming in 6th in Heisman voting as a Sr). 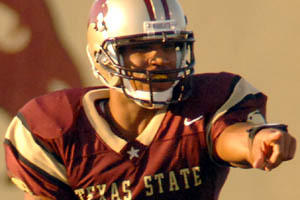 Randle El was the first player in Division I history to pass for 40 career touchdowns and score 40 career touchdowns. He was the Big Ten Player of the Year in 2001 and was named the first-team All-American quarterback by the Football Writers Association of America. He finished his college career as the fifth on the all-time NCAA total yardage list, and became the first player in college football history to record 2,500 total yards for four consecutive years. He finished his career with 7,469 passing yards, 3,895 rushing yards, and 86 touchdowns running and passing. He converted to the WR at the Senior Bowl, where he embraced the fact he was not going to be a NFL QB. 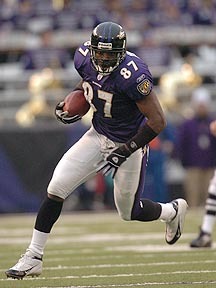 He was drafted in the second round of the NFL Draft in 2002 by the Pittsburgh Steelers and moved to WR. Together with Hines Ward and Plaxico Burress, he made up part of what was widely regarded as one of the top wide receiver corps in the NFL. Additionally, the Steelers made him their top kickoff returner through the 2004-2005 season and their top punt returner since he joined the team. Recently signed with the Washington Redskins to a seven-year, $31 million deal. BQB_Site's View: Maurice Avery is an interesting player, because he was never really given the chance to establish himself as a QB until his Senior Year. As a senior, Avery passed for 894 yards and five touchdowns, and carried the ball 132 times for 570 yards and five scores. He had one of his biggest games in his first start of the season at quarterback against Houston when he passed for 112 yards and two touchdowns and rushed for a career-high 105 yards and one score. He helped the Tigers to a victory in the Motor City Bowl. He has been moved around in the Memphis offense and WR seems to be the best fit for him. He participated in the Hula Bowl as a WR and has the speed and playmaking ability to stick around at the position at the next level. We see him being drafted late or signing as a UDFA. May need to go to NFL Europe, CFL, or Arena to learn one position. He definitely will get a long look in training camp due to versatility and the success of Antwaan Randle El in 2005. BQB_Site's View: Ronald Curry is an intriguing Quarterback, because the public has not gotten the chance to see him fully in college. Curry is a former Two-sport athlete (football, basketball). Curry came out of the same Hampton, Virginia area as Mike Vick and Allen Iverson. He outshined everyone in Virginia and the nation by being named the National High School player of the year in 1997. He however never concentrated on football and always seemed to have an injury (Achilles Tendon) that held him back from fully developing. Coaches have always toyed with the idea of playing Curry at other positions, because he is such a great athlete. At North Carolina, Curry was a Two-way standout who also performed as the starting point guard on the school's 2000-2001 basketball team. Curry was a four-year gridiron starter who shared signal-calling duties with Darian Durrant in his final season. He holds the school's career-records with 4,987 yards passing and 6,236 yards in total offense. Also established team career-records for quarterbacks with 1,249 yards and 13 touchdowns rushing. Finished his career with 345 completions of 695 passes (49.6 percent) with 28 touchdowns and 35 interceptions. The Oakland Raiders drafted Curry in the 7th round as a developmental QB and “Slash” type player. He made the Raiders roster after training camp in 2002 by returning kicks as well as learning the quarterback position. He is currently on the Practice Squad after being on the active roster earlier in the 2002 season. Curry was activated by the Raiders for Super Bowl XXXVIII. I believe that Curry will need to have at least two years of learning the QB position and learning to read defenses. I am worried that he will be viewed only as a utility player (QB\KR\DB\WR\RB) and not as a starting QB in the NFL. He will have to navigate the same territory as Kordell Stewart, another great athlete, who had to prove that he was starting QB material. He may need to spend time in NFL Europe learning more about the game and position. BQB_Site's View: Marques Hagans is an interesting player, because he didn't establish himself as a QB until his Junior Year. 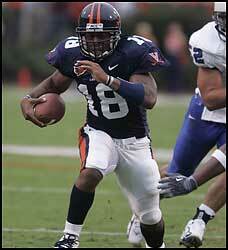 He led UVA to a victory in the 2006 Gator Bowl. He has been moved around in the UVA offense and had to wait his turn at QB behind current Atlanta Falcon QB Matt Schaub. Hagans played WR while Schaub was at UVA, but always had an eye on the QB position. He had to prove to coach Al Groh that he was a QB and when given the opportunity in Spring ball he easily outshined heralded recruit Anthony Martinez. Hagans is a dual threat who makes plays in and out of the pocket. He is smallish at 5-10, but wants the chance to be a QB first. Hagans is a willing team player and if he does not make it as a QB, WR is a viable option. As a QB, he definitely will need to show the talent evaluators that he can see over the line of scrimmage. Hagans will be going to the 2006 Scouting Combine as a WR. We see him being a late round draft pick or UDFA, who will have to make the team on Special Teams. He may need seasoning in NFL Europe, CFL, or AFL to make it as a passer and as a WR he needs to work on his routes. He has the speed and playmaking ability to stick around at WR and he definitely will get a long look in training camp due to versatility. Has been invited to the NFL Combine to workout as a WR and possibly as a QB. BQB_Site's View: Emerged as the starting quarterback midway through spring practice ... Coaches are impressed with his leadership, maturity and poise ... Does a good job of directing the offense and the players seem to have confidence in him ... Is a good athlete with multiple skills ... Has a strong arm and can go deep ... Is also an effective runner and is tough to bring down in the open field ...JUNIOR COLLEGE — Two-time Junior College All-America selection ... Rushed for 816 yards and 10 touchdowns and threw for 932 yards and eight TDs his final season at Garden City ... His team finished the season 10-0 and ranked number one in the junior college ranks ... Played for Coach Bob Larson at Garden City. 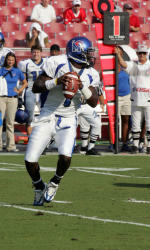 BQB_Site's View: Poor Man’s Vince Young, who has battled injuries and inconsistency throughout his college career. Reggie McNeal entered A&M as one of the elite dual threat QB recruits in the country. He progressed steadily and is a top dual threat college quarterback. McNeal moved into the starting lineup as a sophomore and threw for 1,782 yards, eight touchdowns to seven interceptions, while completing 51.1% of his passes. He added another 370 yards and 4 touchdowns on the ground. McNeal made dramatic improvements as a junior, finishing the year with a school record 2,791 yards, with 14 touchdowns to just four picks, while completing 58.1% of his passes. On the ground, he ran for 718 yards and eight touchdowns. As a Senior, McNeal sprained his left ankle during a 36-30 loss to Oklahoma on Nov. 12. He battled back and showed in the East-West Shrine Game that he is a playmaker. In the game, he was named MVP displaying his great throwing and running ability in a West Victory. He has a very good arm, and can make every throw on the football field. He will stand in the pocket and deliver a strike. When things break down, he can leave the pocket and find a receiver, or tuck it and pick up yardage. McNeal is an awesome athlete, and has excellent speed. He could probably switch to wide receiver at the next level if the QB position does not work. We see him going late in the draft (6th or 7th Round) or signing as a UDFA. He may have to contribute on Special Teams or at WR to make an NFL Roster. If the NFL does not work out, he definitely could be a great CFL or Arena QB with his speed and strong arm. Has been invited to the NFL Combine to workout as a QB and possibly as a WR. BQB_Site's View: A starter for the past two seasons after transferring from Houston, Nealy has emerged as one of the top run/pass threats in I-AA. He threw for 4,331 yards in his first two seasons behind center, and also ran for 670 yards and five touchdowns during that stretch. 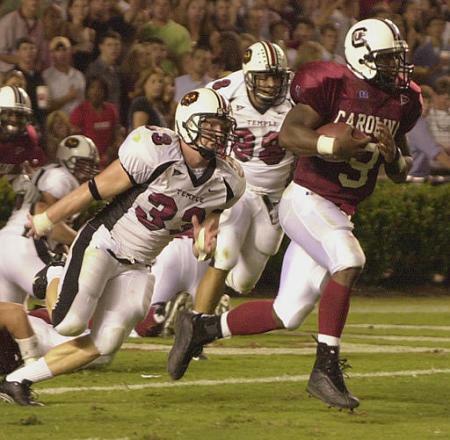 Nealy threw for 1,202 yards and 10 touchdowns in 2004, and raised his completion percentage by 10 points to 58.7. He also ran for 409 yards and two touchdowns last year. In 2005, he threw for 2875 Yards with 21 TD's and 9 INT's, plus 1057 Yards Rushing with 13 TD's while leading Texas State to the D1-AA Championship Semi-Finals and an 11-3 record. Played in Hula Bowl and East – West Shrine Game as a QB and WR. He will stand in the pocket and deliver a strike and when things break down, he can leave the pocket and find a receiver, or tuck it and pick up yardage. Nealy is an awesome athlete, and has excellent speed. He could probably switch to wide receiver at the next level if the QB position does not work. Thick Build similar to a smaller Daunte Culpepper. We see him going late in the draft (6th or 7th Round) or signing as a UDFA. He may have to contribute as a WR to make an NFL Roster. If the NFL does not work out, he definitely could be a great CFL or Arena QB with his athleticism. Was not invited to the NFL Combine, so he will have to shine in his private workout. BQB_Site's View: Robinson was a 1-Year Starter at QB for Penn State, who became the BIG 10 MVP in 2006. Robinson is one of the better all-around athletes in college football. He has played QB, RB, and WR during his days with the Nittany Lions. Robinson is the all-time Total Offense leader in Penn State history. He has over 500 yards Passing, Running, and Catching. During his senior he displayed leadership, toughness, and tenacity in leading PSU to 11 wins including comeback wins at Northwestern and in the Orange Bowl over Florida State in an overtime thriller. Since he has not played the same position throughout his college career, he suffered as a passer. He completed only about 50% of his passes, but was known for making big plays down the field to his young WR’s. He will probably be asked to be an “Athlete” (WR/KR/RB) at the NFL Level. He wants to be a QB, but NFL evaluators thought he looked better at WR than QB at the Senior Bowl. Robinson will need to decide if he wants to continue to pursue the QB position. We see him being drafted in the 2nd or 3rd Round as a player that will help on Special Teams, As a Backup QB, and Slot WR. He should be able to contribute in many ways and the NFL is always looking for “Football Players’. He has shown at PSU that he is a great leader and contributor. He definitely will get a long look in his rookie season as a “Slash” due his to versatility and the success of Antwaan Randle El in 2005. May need NFL Europe or Practice Squad seasoning if he wants to remain a QB. Has been invited to the NFL Combine to workout as a RB/WR and possibly as a QB. The BQB-Site Website has been accessed times.